The Colchester Young Archaeologists’ Club (YAC) met here at the Roman circus visitor centre on Saturday 15th for their July meeting. Colchester YAC organiser Barbara Butler writes: ‘… A few weeks ago, the Colchester YAC met up for our July meeting before the school summer holidays. 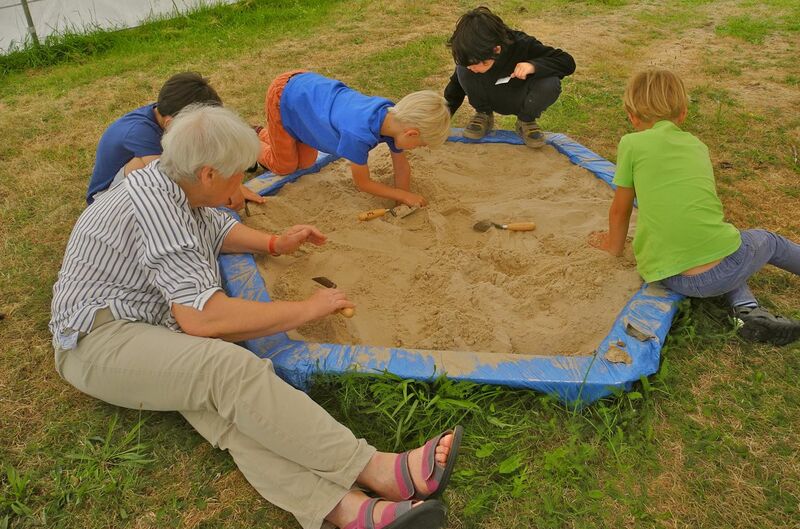 YAC members honed their excavation skills in a sand-pit in preparation for our day helping the Colchester Archaeological Group with their dig at Fordham near Colchester in September. 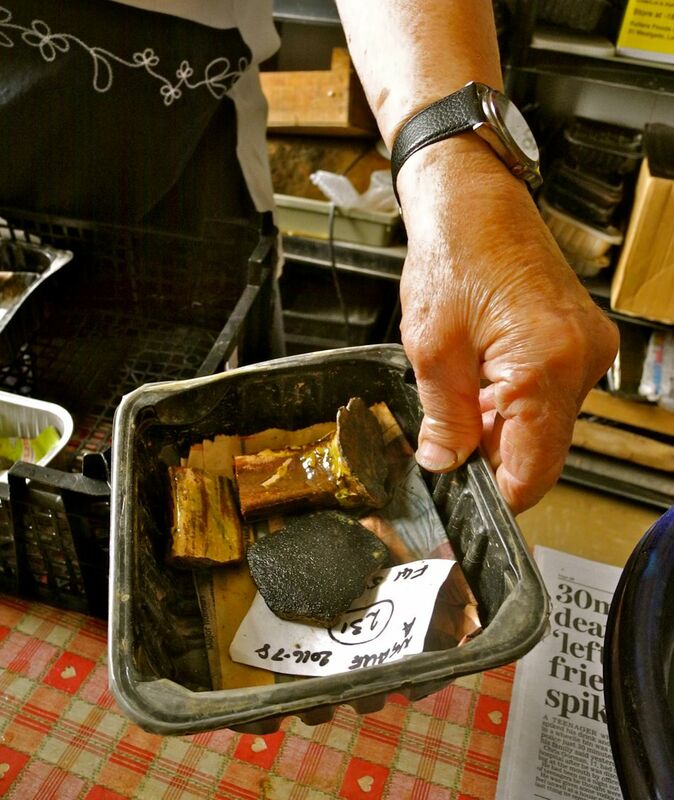 New members were instructed how to use trowels and how to wash the finds. Gillian Brown is a YAC and Colchester Archaeological Trust volunteer, and she has 16 years’ experience of washing archaeological finds for the Trust. 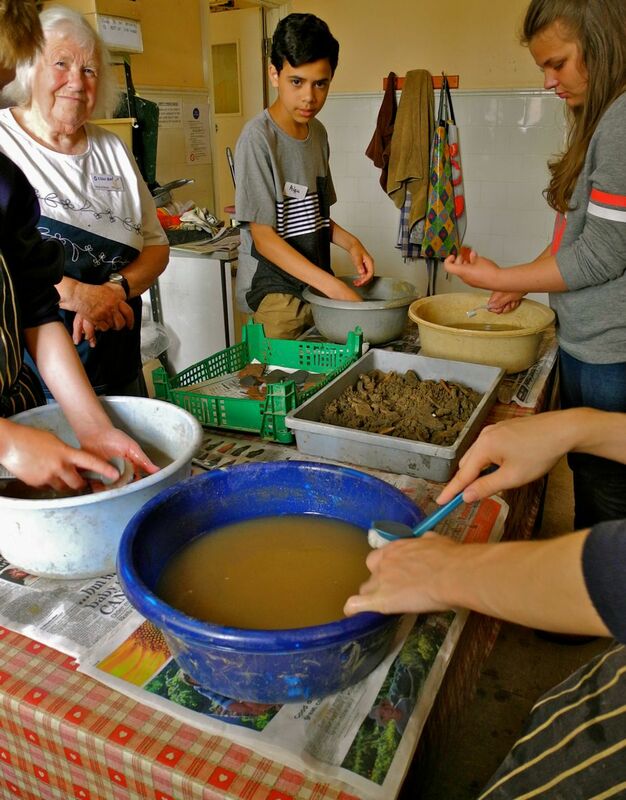 Gillian showed YAC members how to wash pieces of medieval pottery, including some recently-discovered fragments of decorative Colchester Ware pottery, in the Trust’s processing room. We were able to look at a partially reconstructed Colchester Ware pottery jug, the fragments of which the Trust excavated on the Chesterwell site at Mile End, on the north side of Colchester, in early 2017 (you can see a photo. of the jug on this web-site at www.thecolchesterarchaeologist.co.uk/?p=35599 ). YAC members also made their own medieval-style pots out of Plasticine. 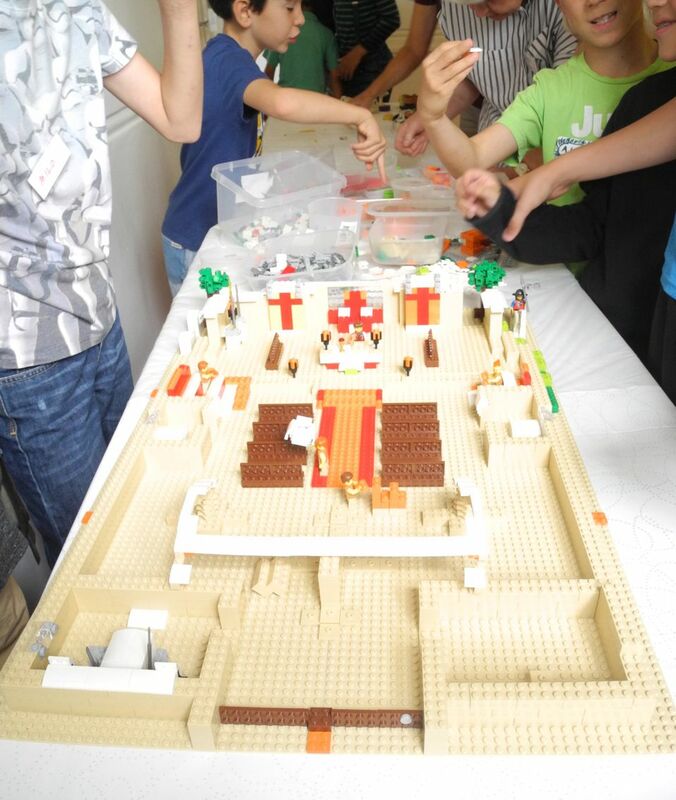 A joint project during the meeting was the making of a plan of a medieval abbey church out of Lego. Groups of members produced parts of the church plan on separate bases, and then joined all the bases together to make the grand plan of a medieval abbey church. The Roman circus visitor centre is, of course, not far from the site of the Norman and medieval St John’s abbey, and the surviving St John’s abbey gateway and length of abbey precinct wall: the Trust investigated part of the site of the abbey church in 2013. As usual with our YAC meetings, the time went too quickly …’. The images show YAC members excavating in the sand-pit; washing finds with Gillian; and working on part of the abbey church plan. If you are aged under 17 and interested in joining the Young Archaeologists’ Club in Colchester, then please contact Barbara Butler on 0 7 8 0 8 9 6 8 7 6 6 or at barbara[at]peterbutlerdesign.co.uk or Barbara Butler, Colchester YAC Branch, c/o the Colchester Archaeological Trust, Roman Circus House, Roman Circus Walk, Colchester, Essex CO2 7GZ.